I have a lot of time for writer-director Blomkamp ever since his inventive, hyperkinetic District 9 stomped onto the screen and blew everyone away, reaping $211 million on a $30 million budget. I’ve always liked my sci-fi to be a metaphor for an issue or a philosophy, particularly in literature; the genre is fertile for it, and the addition of even a little intellectualism goes a long way in keeping me engaged between explosions and screamin’-at-ya boastful special effects. Just as District 9 examined apartheid, Blomkamp takes the idea of unjust segregation a step further by imaging a future where the war on immigrants has reached a point where the rich have simply left the planet, allowing it to fester under hoards of poor folk policed by indifferent, ruthless robots. There is also a side nod to environmental disasters, a pet cause for Matt Damon, the film’s star. Damon plays Max, an ex-con struggling to stay on the righteous path by working on an assembly line for a robot manufacturer headed by John Carlyle (the robotic William Fichtner). Carlyle is a citizen of Elysium, an idyllic space-station wheel the size of a small European country orbiting Earth. 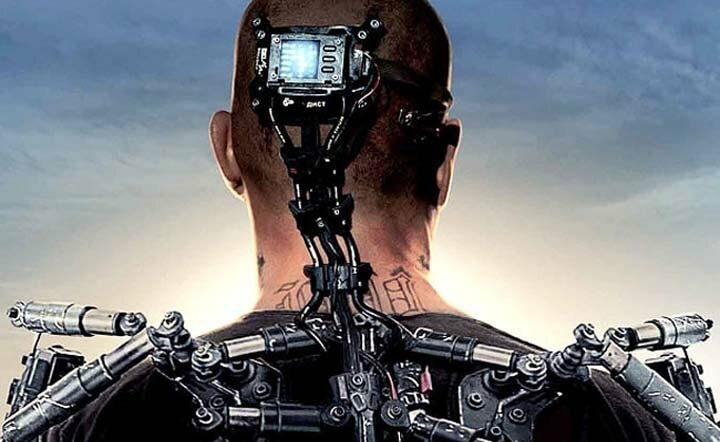 After an accident at the plant leaves him in mortal peril, Max has to surmount impossible challenges and get to Elysium so he can benefit from one of the med beds that keeps its citizens youthful and immortal, unless they come in the way of a bullet, of which there are plenty in this film. There is little one of these miraculous beds can’t fix, including a grenade explosion in the mouth, one of the more outrageous plot points that cause this film to wobble throughout (but so severely in the third act that it collapses). Destiny brings Max face-to-face with sociopathic Defense Secretary Delacourt (Jodie Foster), and the rest you’ve seen before. I’ve never understood why Mel Gibson apologist Foster is considered one of our finest actors, but I never got Michael Jackson, either. As to her presence in this particular movie, why would someone who can benefit from this amazing rejuvenating technology want to look like a bitter, middle-aged Hobbit? 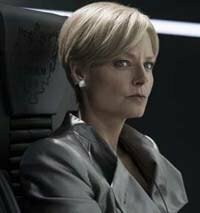 Clearly Blomkamp was seduced by Foster in some way: she is allowed to show off her impeccable French for no reason that explains her character or the story other than Foster speaks impeccable French in real life. I would have kept it real and cast a Carey Mulligan or Michelle Williams, or any one of those sweet, sensual younger women who could have been given the opportunity to play against type. Foster is almost too much of a shrew in real life to play one on screen — it’s overkill. The presence of middle-aged people on Elysium is but one of a few plot holes big enough to collapse entire galaxies. Every time one of those holes collided with the story, I felt like I was in one of those old New York checkered cabs with no shock absorbers, barreling up a poorly paved avenue hitting craters along the way. For the most part I was able to ignore them by letting myself be amused and impressed with Blomkamp’s gritty, realistic production — with the exception of Joon-ho Bong (The Host), nobody integrates special effects with live action as organically as Blomkamp — but at the end of the day this film doesn’t touch District 9. That was a delightful surprise, this borders on commonplace. The main problem is the script has been Hollywoodized, bookended by hackneyed symbolism about fulfilling your dreams and the beauty of planet earth, and weighted down by a love story that didn’t connect with me. Just give me the undiluted Robocop meets Mad Max meets Soylent Green meets District 9 and hold the pansy emotionality. Thanks. 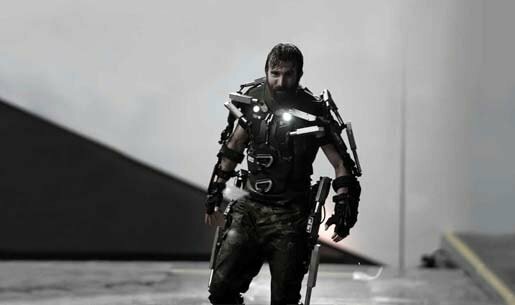 The brilliant star of District 9, Sharlto Copley, plays Kruger, Delacourt’s Boer henchman on earth out to make Max’s life as much hell as possible. He is by far the most enjoyable and riveting character, and makes you wish Blomkamp had stayed true to his origins and made this entirely with South African actors in that country. But that’s just me being idealistic and disingenuous — if you get into the hot tub with the studios, you can expect them to piss freely and abundantly in the water. Los Angeles imagined as a sprawling Tijuana — I believe it’s actually Mexico City — works exceedingly well in creating a dystopian landscape that isn’t seeped in the usual darkness and rain. Rather, it’s parched and sundrenched, crowded and dusty, much like the alien containment area in District 9. Elysium itself is more like the tonier parts of L.A. slathered by a thick coating of Persian influence — with that sort of garish nouveau riche aesthetic I would have gone the whole hog and had the citizens look more like the Kardashians, but that might have drawn even more attention to how misplaced Foster is. Despite the moth-eaten relationship drama and those rents in the plot — and one of the most disappointingly trite endings I’ve seen in a long time — Blomkamp is a natural master of the pacey script. His singular vision makes him something of an auteur in an industry currently dominated by geeks churning out the same brand of special effects — let’s call them McCGI. 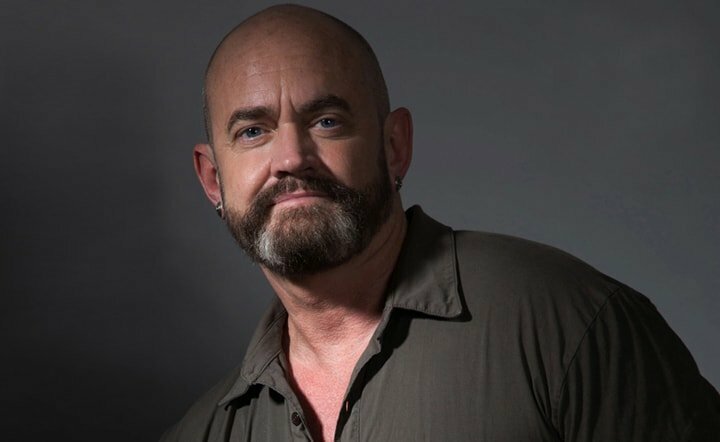 He also has a delicate way of building successful characterization while on the fly with his handheld camera, his rapid cuts and his storming sequences. As for Matt Damon, he continues to be his Jason Bourne self. It was nice to see him finally act a bit in Behind the Candelabra, but don’t hold your breath that you’ll see him in anything like that soon.